Besides the Rostam tracks, I Need Your Light is trapped in limbo between indie and pop. Looking back at their debut full-length, The Rhumb Line, their exuberance seems deserved; it’s a good record that captures the irony and optimism of early, danceable indie-pop. Chris DeVille of Stereogum describes that moment well, as he tracks the lineage of the genre from what it was then to what it is now; consistently approaching mainstream pop. Ra Ra Riot’s career has tracked along roughly apace. When they dropped the first single “Water” off of the new record, it seemed that they were not only back on track from those early days in the spotlight, but, the mix of trashy, Drozd-esque drums and a pleasantly Swift-ified chorus heralded a band ready to tap the best of their years of experience and tackle some real pop. Which they seemed remarkably capable of. And based on singles alone, they’ve achieved just that. “Water” is a great opening track to I Need Your Light. It reminds me of the irresistible song “Magic” off of Coldplay’s otherwise mediocre Ghost Stories -- the singles market is lucky to have it. But, unfortunately, in the context of the full record, it makes track two hit like a Spotify ad in the middle of your gettin’ busy playlist. And unfortunately, it’s not until title track “I Need Your Light”, the second and only other collaboration between Wes Miles and Vampire Weekend’s Rostam Batmanglij (old friends and collaborators as R&B duo, Discovery) that the mood is regained. Rostam seems to be somewhat of a frontman whisperer. It’s partly what makes his recent departure from Vampire Weekend such an intriguing prospect. 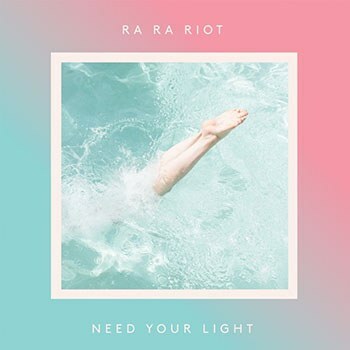 On I Need Your Light, his contributions provide a hip counterbalance to Miles’ indie pop ebullience, a balance that, based on the other eight tracks on the record, doesn’t seem to exist internally in Ra Ra Riot without him. In lieu, I Need Your Light suffers from arrangements of songs whose attempt at humor lacks context that endears us to them. His forays into falsetto and anthemic choruses, all sung well, are too often weakly supported by thin, cheesy references to late ‘70s pop. “Call Me Out” sounds like their take on Journey; on “Instant Breakup” they indulge their inner Rush on the bridge on a song that awkwardly seems to be about a couple debating sexual exploration; “Bouncy Castle”, an already vulnerable song about a childhood erection, packs an unfortunate Mr. Roboto-style chorus. I get the chronological specificity, but it’s not easy to listen to. These arrangement decisions seem to correspond with a general sense of uneasiness about direction. In many ways they seem to mirroring other indie-to-pop crossovers like ‘80s maximalists, St. Lucia, or contemporaries from the Williamsburg indie pop bubble, Passion Pit, both of whom are pushing the genre in a bigger, louder, very loud direction in their latest major label releases. But at the same time, I Need Your Light clings stubbornly to a spotlight on songwriting and band format that others of their former cohort, like Vampire Weekend and Dirty Projectors, pursued exceptionally. Most tracks feel caught in between the two. Like some kind of indie pop puberty. Ultimately, the record finds a happy medium when its at its most Swiftian. Tracks like “Water” and “I Need Your Light”, as well as the giant chorus of “Bad Times” seem genuinely comfortable with their own magnitude. They ring true with the work of our best pop stars who have approached indie from the other end, like Swift or Carly Rae Jepsen, and have shown it’s possible to be both small, attainable, and yet magnetically effective pop music. Handling the intimacy themselves and working with the right producers to make things big, they achieve the anthemic effortlessly. I Need Your Light is a sign that some major inroads are being laid here to an original brand of indie-informed pop music, and Ra Ra Riot seem to have all the raw materials at the ready to make that work. Honestly, they just gotta lose the "Yes".